Instructions: Create a 5.5 inch x 7.5 inch card base. Cut out a piece of snowflake paper from the Merry and Bright Paper Collection slightly smaller than the base, distress and adhere to the card base. Sponge the top third of a 4.25 inch x 5.5 inch piece of cardstock with Paradise Teal, stamp the trees from the Snowy Pine Village set in black on the top third. Stamp the houses from the same set in black on white cardstock, color with markers and cut out with coordinating die, layer with foam circles on top of the trees, cut out two snow slopes with the Fleur Border Basics Die. Stamp trees from the Snow Kissed Spruce and Snowy Pine Village sets in black, cut out with corresponding dies, sponge with Fern Green, accent with Dries White Glue and sprinkle with Frosting Powder. Stamp the deer from the Woodsy Critters set in black and sponge with Butter and cut out with corresponding die. Adhere deer and some of the trees in the snowy slopes, as seen in the photo. Stamp the Poinsettia and Holly Clusters (medium and small flowers used here) in Lady Bug Posies, sponge with same and cut out with corresponding dies. Stamp holly in Fern Green and sponge with same. 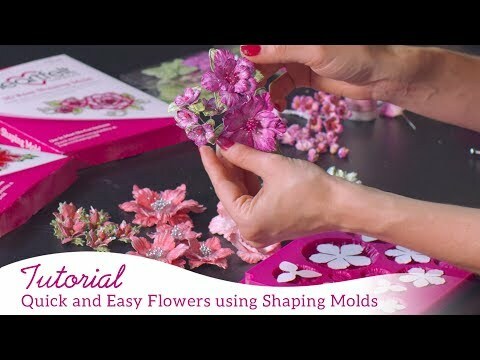 Sculpt the Poinsettia and Holly Clusters with the 3D Poinsettia Shaping Mold. Stamp the Sparkling Poinsettia (small used here) in black, cut out with corresponding die, and sponge centers with Buttercup and the outside with Rhubarb Stalk, sculpt with the Sparkling Poinsettias with the 3D Floral Basics Shaping Mold. Add yellow prills to all the poinsettia centers. Stamp the large holly form the Large Sparkling Poinsettia in Library Green, sponge with the same and cut out with corresponding dies. Add frosting powder to the poinsettias. 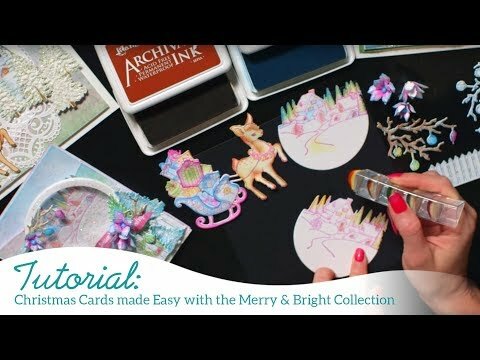 With Archival Black, stamp pine boughs from the Snowy Pine Village, pine cones from the Merry and Bright Accents set, and the scroll from the Silent Night Scroll set, color with markers or sponge with ink, sponge with glue and add Frosting Powder. Cut out the Decorative Medallion Die in white cardstock and the outlining die in blue paper from the paper collection adhere behind the panel with the snowy houses toward the right side of the card. Adhere trees beside the panel on the left with the scroll on top, add a couple small poinsettias and adhere the flower and bough spray below the panel as shown.